…dressing people up in fancy costumes. Especially, dressing people up who can wield wit and weaponry with equal aplomb, as my incarnation of Jane can. After so long wandering in the desert, I admittedly binged on pretty frocks when writing Jane Steele. As if I’d gifted myself a whopping pile of paper dolls and went frenzied with the scissors, slavering all the while. I’m no fan of gender binaries. Let’s not pretend that world-renowned army doctor badass John Watson, he of transcontinental "experience," a heart of gold, and doubtless VERY capable hands, never noticed the silhouetted figure of a female. My favorite such passage occurs in Doyle’s “The Man with the Twisted Lip”: “…the door flew open, and a little blonde woman stood in the opening, clad in some sort of light mousseline de soie, with a touch of fluffy pink chiffon at the neck and wrists.” The man can survive Afghanistan, shoot a service revolver, and wax rhapsodic about neck fluff with the same tender finesse. With Jane Steele, however, I glutted on fashion like a morning talk show host who’d run dry of celebrities, corralled a herd of pedestrians into the studio, and shoved them into makeover chairs. 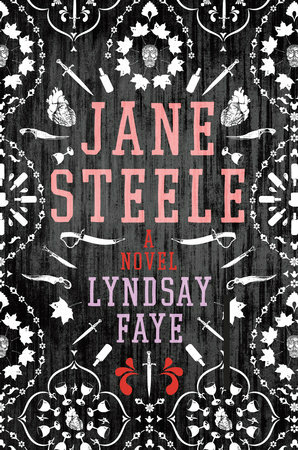 I love fashion, and Jane Steele like Jane Eyre spends years as a penurious student and later governess. The lack of food she suffered must have been bad enough, but what about the lack of pink chiffon? The mind revolts. So I started researching 1840s-1850s fashion. My version of Jane embraces infamy, dispatches myriad villains, and acquires a small fortune—why shouldn’t she do so in French heels? As an unrepentant style nerd (I once stood in line for the Met's Alexander McQueen exhibit for five hours), I wanted to invest her with real historical splendor. Since words are inadequate to describe these outfits (especially when you’re wiping drool off your keyboard so frequently), here are a few quotes appearing in Jane Steele, matched with their historical inspirations. Fashion is very much entangled in Jane’s feelings, obviously, and I do tend to think of clothing as a sort of armor when it’s well-selected—a daily broadcast to the world of acceptance, defiance, mood, taste, or whatever else we express when we stand backlit in doors clad in mousseline de soie, or you know...a Nirvana t-shirt. So whether your wardrobe runs to blue jeans or ball gowns, I hope you love your own skin and enjoy Jane Steele. Clothes don’t make the woman—but under the proper circumstances, I think they can certainly make her day.